I’ve been married to The Greek Mister for a year now and I have to say that his family’s warm welcome to me also made such a difference in our relationship. The Greeks are very warm and affectionate people, they are not shy to show their emotions towards anyone which is what I love about them as it is somehow the same with the Filipino culture. I always leave with a big smile on my face and a positive vibe in me after seeing his family – their loving nature is infectious. It’s like a powerful virus – once you get it, it’s yours forever which goes the same way for being Greek. I think by now I am already 1/4 Greek and I do take great pride in it which is why I’m trying my best to understand them more – their culture, traditions and language. Having had a full week of holiday with them, I think my Greekness just went up a notch. Here are just some of the new things I learned from my holiday with my Greek family. 1. You will gain weight in a matter of 40 minutes after spending time with your Greek family – more specifically, with Yaiya (grandmother). The Greeks, at least the women, find such immense joy when they are able to feed you. I had the wrong decision of eating something before going to Yaiya’s house so I had to politely decline each and every single dish that she offered me. I can feel her heart breaking so I eventually said yes when she offered me an orange juice – her eyes lit up, she squealed in delight and hurriedly went into the kitchen to pour some orange juice in a glass. She did it with so much joy and happiness that if you were watching us from afar, you’d think that she was so happy because I solved the Greek crisis. 2. Except for breakfast, the Greeks have an erratic time of eating a meal. It is widely known that Greeks went out for dinner at a time which the rest of the world considers as the time you go home and go to bed. Lunch can be between 1pm to 6pm while dinner is anytime after 10pm. I asked the Greek Mister how it was for them when they were kids, I used to be sleeping at 9pm so I was wondering if they have somehow worked around this culture to give kids enough time to digest a meal before sleeping. No, we eat at 10. The Greek Mister replied. This works well during summer though since you’ll have a longer day during this season, sun sets at around 9pm so having your lunch at 5pm is somehow acceptable. Going out after midnight for drinks may be quite too late for the rest of the world but the party’s just getting started in Greece at that time since they have just finished their dinner then most probably. 3. There is a specific drink at a specific time for a specific dish. The Greek coffee which is more famously known as Greek frappe is to be consumed first thing in the morning as soon as you wake up. This is best with your self-rolled cigarette. 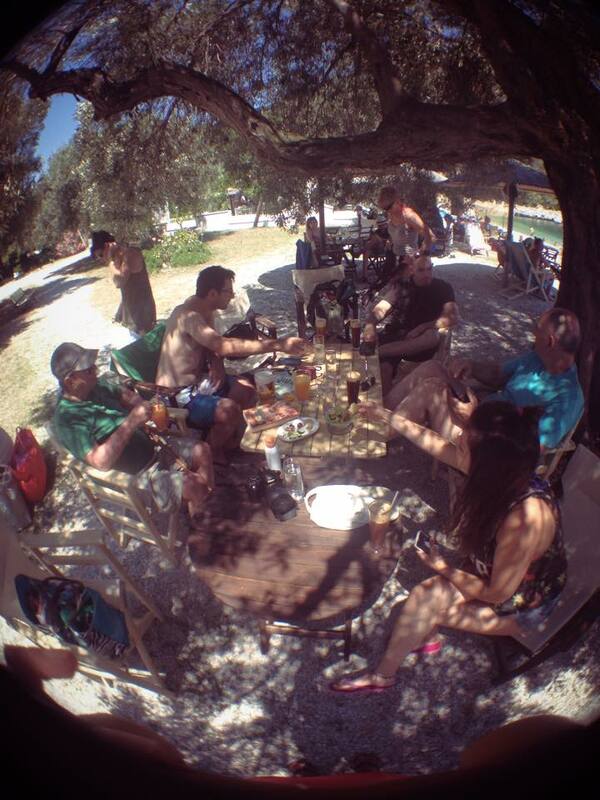 Tsipouro or ouzo is an appetizer for lunch, you’ll see this normally on the table at around 1 or 2 in the afternoon. This is best with seafood dishes specifically a gavros marinatos which happens to be my favorite Greek dish. Beer is for meat, you’ll drink this right before dinner to somehow warm-up your stomach before the meat feast and you’ll continue on drinking as you’re eating your last meal for the day. After that, you can drink whatever is left in your fridge. 4. Teasing your partner is highly encouraged. It’s the Greek women who are very good at this based on my observation. Nonnos (godfather) once asked Nonna (godmother) where their teenage granddaughter was. “She’s talking to someone on the phone upstairs, that’s the only place where she can get a signal.” answered Nonna. Nonnos then erroneously asked this follow-up question, “What do you mean a signal?” to which Nonna replied with unmistakable sarcasm “She’s upstairs giving out hand signals to the other person she’s talking to in that island!” points at the island opposite from where we were. 5. Greek women are always right. No matter what happens, whatever the case may be, even though the husband is nowhere to be seen and even if the husband is not physically in the place of the crime – it is always their husband’s fault. It doesn’t matter what it is, the husbands are always to be blamed for everything. Dinner time with the family! 6. They may act tough, they may act like they’re the boss but the Greek wives are still very caring towards their husbands in their little own ways. Every morning, a Greek coffee is prepared for the husbands without even them asking for it. During a meal, the wives are preparing their dishes and looking out after them, making sure that they’re eating enough and are having healthy choices during the course of the meal. The husbands cannot sneak an extra slice of pancetta or an extra glass of tsipouro when their wives have decided that they’ve already had enough (that’s about after 9 small bottles of tsipouro consumed). Clothes are lovingly prepared for the husbands to change into and they make sure clean towels are ready for the husband’s quick shower. There is more to a Greek woman than meets the eye, they just don’t show it to the world as it’s exclusive only for their husbands. 7. No matter how old you are, you are still a child in your parent’s eyes. The Greek Mister is called Nikolaki which translates to small Nikos which is my husband’s name. I became Noemoula which translates to small Noemi. I can’t help but giggle everytime I get called that. Kisses are also widely given even to full-grown men – I’ve witnessed my father-in-law quite a few times giving big, wet kisses to The Greek Mister which normally happens after a few glasses of tsipouro. 8. The Greeks love their songs – specially the old ones. Wherever we may be – a taverna or a bar or any other place which plays a Greek song, at some point – there will be someone who will translate what the song is about to me. I’ve never met any other person of a different nationality who would do that, the Greek culture flows even from their music. Most of which are poems about being nationalistic, history, love, betrayal, death and glories. 9. The Greeks can never talk without having both their hands free. Their very expressive nature requires their words to be accompanied by hand gestures. You may as well be at least 4 feet away from them while talking as you might get slapped on the face by accident with these hand gestures. 10. The Greeks swear a lot, so much that I learned the curse words first rather than saying hi in Greek. It was easier for me to pick up those words as I have grown accustomed on hearing it from The Greek Mister who would sprinkle these words in each sentence that he will utter without actually meaning it. They use it as a filler, I’ve never heard anyone say it and actually mean it. Still, I do admire their ability to infuse these words in each sentence no matter what the topic is and still make sense. Last but not the least, you don’t really need to speak and understand Greek fluently because they will have a way to express to you how much they have accepted you as a part of their family. That is the case for me at least. I fell in love with The Greek Mister even more knowing that he came from such a loving and fun family. Related post: My Big Fat Greek Story – Meeting the Greek boyfriend’s family. Santorini, How Much Does It Really Cost? A Travel Expense Guide For A 3-Day Stay in Santorini. I love how you describe all the little rituals and quirks of your Greek family, it made it easy to imagine them, they seem really welcoming and lovely. This makes me wish I could be invited to dine with a Greek family. It sounds like fun and I would love to try all those different drinks haha. She’s upstairs giving out hand signals to the other person she’s talking to in that island! I love hearing couples tease each other! I don’t think I’d be able to wait until after 10pm to eat. It seems that family is very important to Greek people, which is lovely to see. If you ate your lunch at 5pm, it’s very easy to wait for 10pm to have dinner. Haha! I should really get going to Greece. It is a neighbouring country (I am Bulgarian) and their unique combination of beaches, delicious food, and lifestyle makes it so desired for many tourists (Bulgarians included). I have tried many of their dishes and drinks and I love them all. I did not know that they swear that much, but, oh, well, Serbians do too. Lol. I found it really weird at first too, 10pm as dinner isn’t really ideal but I learned to take a nap in the afternoon because Greek nights tend to be so much longer than the rest of the world. Lol. Very interesting post. I liked learning about the culture and customs from you. I especially like that the woman is always right! 🙂 I can relate when you say it’s like you’re a quarter Greek now. I’m married to a Singaporean and sometimes I feel a bit Singaporean too, even though I am not at all. Likewise he feels a part of my culture as well. I enjoyed reading your insights into your Greek family and love that you are fitting in with them so readily. Those mamas sound formidable and funny. I definitely am fitting perfectly with them, somehow I can see myself as them. Haha. It’s fascinating to learn about other culture up close. Absolutely true! 🙂 I find it very interesting. Don’t forget the freddo cappuccino! Yeah, your point on weird meal times. I noticed that when I travelled to Greece too! But I guess it’s fine for us, we just have 2 lunches and go back to sleep. I was in Greece last summer and I remember this rule of having different dishes at a particular time. It was kinda sweet and well-organised, but I couldn’t get used to it. I eat when I’m hungry so set dinners are not for me! Agness recently posted…What Can You See In Fatima? 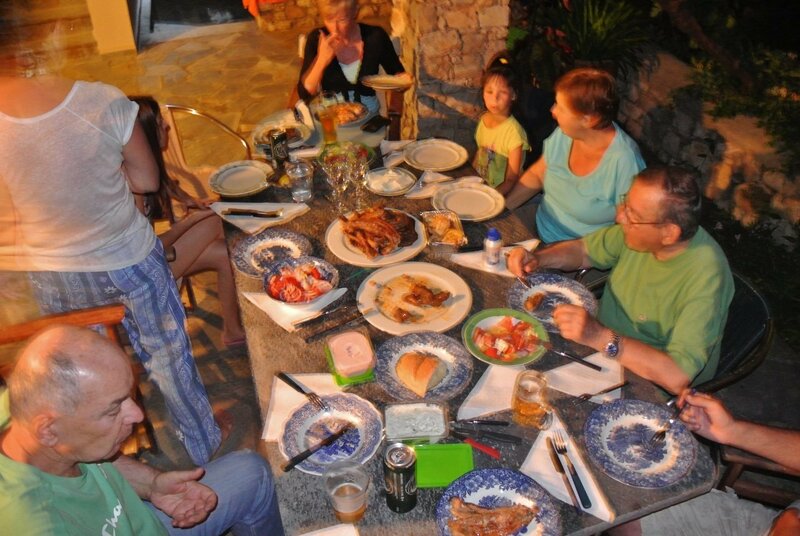 There’s no particular time for meals actually, well at least with The Greek Mister’s family. We eat whenever the food is ready which is always most of the time, late. Lol. Haha! Very interesting facts. In a way I think most European nations have the same way. One thing for sure family values is something they put importance in. I’m sure you had a great time with your new family in the last vacation of yours. So, did they teased you on when little Greek Mister is coming? Of course they did! The little Greekinoy already has a name. Hahaha! Alonissos, The Underrated Greek Island.